To better understand genetic factors involved in brain development, researchers led by Tristan Bouschet and Pierre Vanderhaeghen examined mouse embryonic stem cells. 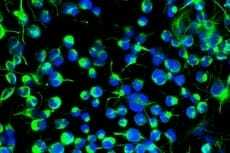 When oncogene BCL6 was overexpressed, the stem cells differentiated into cortical neurons. To confirm the gene’s effect, the researchers engineered mice to lack BCL6, which subsequently resulted in smaller, nerve-diminished brains. The study is published in Nature Neuroscience.